Stinging Nettle is a member of the Nettle Family. It grows to 9 feet in height and has dark green, triangular leaves with toothed edges that grow on opposite sides of the stem to 7 inches in length. The plant grows along streams and near springs at elevations below 9000 feet. Stinging Nettles have stinging hairs, or trichomes which grow on stems and leaves. When brushed, the tip of the trichome breaks off, leaving a sharp, hypodermic needle-like point that injects chemical irritants into the skin. Non-stinging hairs are soft and flexible. Most stings require no treatment other than time. 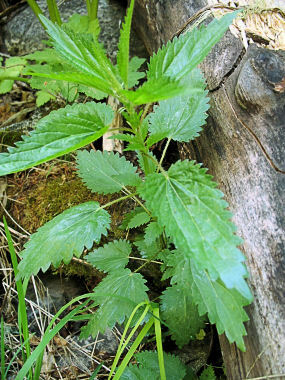 People have used stinging nettles for rheumatism, upset stomach, fevers, colds, paralysis and numerous other ailments. Native Americans helped themselves stay awake at night by whipping themselves with nettles. Though hard to believe, stinging nettles are actually edible, especially when young; they can be boiled and substituted for spinach.